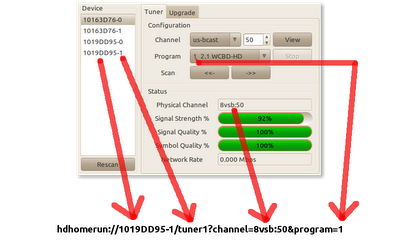 To watch live TV in XBMC using your HDHomeRun you need to configure your channels. You will need to create a text file containing a URI to each HDHomeRun channel. Here is an example URI: hdhomerun://1019DD95-1/tuner1?channel=8vsb:50&program=1. You then add a Video source in XBMC by pointing to the directory containing the text files you created. Below is a graphic on composing the URI. The screenshot is of the HDHomeRun configuration tool on my Ubuntu system. 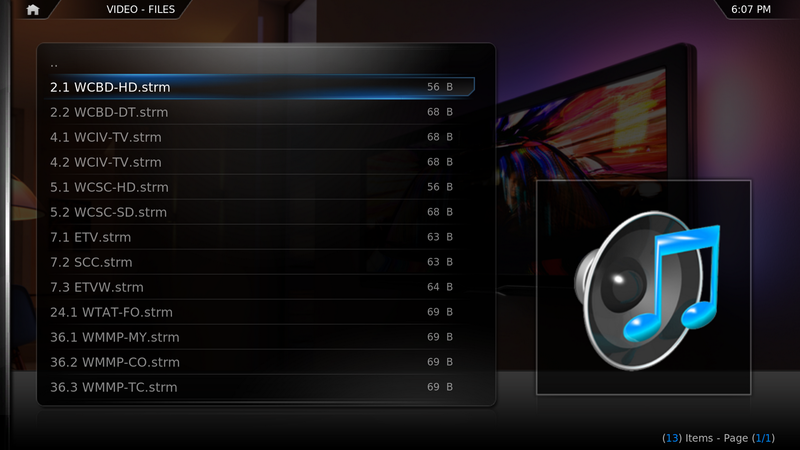 Below is a screenshot of what the channel line up looks like in XBMC. 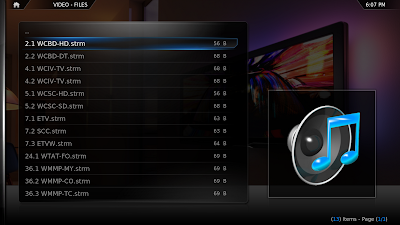 Below is a video of live channel viewing in XBMC. How did you set-up XBMC on ANDROID to stream hdhomerun? Is it a direct stream or is a PC feeding the signal? I want to set-up an Android Box with XBMC and get my locals with hdhomerun. You will need to create a text file containing the URI to each HDHomeRun channel. So, if you have 10 channels you will have 10 text files. 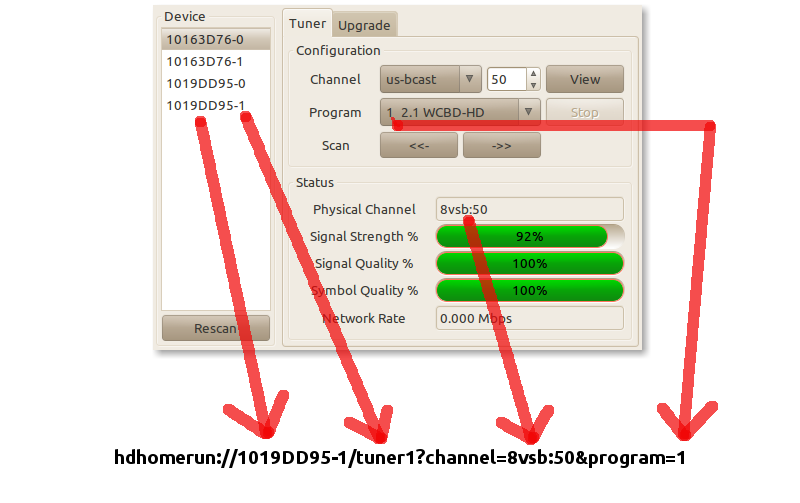 Use the HDHomeRun configuration tool to figure out your URI for each channel. Put those text files on your Android device. Then make the directory containing the files an XBMC Video source. I am new to xbmc and the android app on the link above says not compatible with my device. there are lots of xbmc apps on the app store but they all look like remotes. If I find one that will work on my galaxy tab 8.9 I should be home free. but to confirm I don't need xbmc on my desktop to make this work. Is there a reason XBMC might not see the .strm files in the directory on the device? I can see them in file explorer, but within XBMC its just an empty folder. 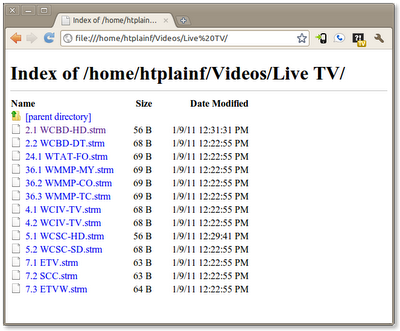 Is there a reason that XBMC wouldn't see the .strm files within the directory? I can see them within file explorer, but with XBMC, its an empty directory. @Phil Vaglia Perhaps a file permissions issue. I figure out what I did wrong. The folder must be added as if its a normal video, not as a video source. Thanks for this blog post. I definitely wouldn't have figured how to do this without it. I saw that you have channel list in TV Shows menu. How you managed to do this? I can only see channel list in Video menu. This is terrific, Patrick! Just what I've been looking for. I'd really appreciate a follow-up article (or a pointer/link) on integrating XBMC and HDHomeRun for DVR functionality.